Once upon a time, live music was played without the assistance of huge electronic sound systems. Instruments were designed to project sound into space, since their players couldn't depend on microphones or pickups to make themselves heard. Whatever the audience was hearing, the musicians were hearing too. One of Bose's new L1 Cylindrical Radiators. The B1 bass module can be seen on the right, and the small handheld R1 control unit is sitting on top of that.Even in the early years of the electric music era, starting when crooners began using microphones and guitarists first plugged into amplifiers, and continuing right up until the late 1960s when rock & roll became big business, the musicians on the stage and the people they were playing to all heard the same thing. But there came a time, at least for the biggest pop music acts, when everything changed. A lot of people point to The Beatles' performance at New York's Shea Stadium, home of the New York Mets baseball team, as the watershed event. Absolutely nobody, onstage or off, could hear any of the music at all. The band's stage amps, although they were the biggest available, and there were lots of them, couldn't possibly compete with tens of thousands of hysterically screaming fans. The Fab Four might as well have not bothered to even plug in; it's doubtful anyone in the audience would have known. After a few more concerts like that, they gave up on touring altogether. 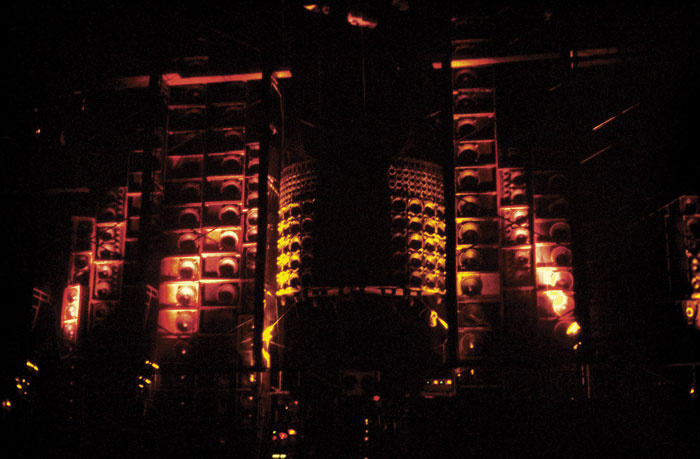 Bose Corporation also remember live music before sound systems, and for the last 10 years they've been working to recapture how music was presented to audiences before concert producers found it necessary to employ the megawatt amps, 18-inch subs, and flying tweeter arrays that everyone takes for granted today. Now they've announced a new line of products that might provide a considerably simpler solution to the problem of affordable, compact live-music amplification. When you think about live music systems, Bose is not exactly the first name to come to mind. The company is a somewhat quirky organisation located in Massachusetts, on the East coast of the USA, and who are celebrating their 40th anniversary this year. Privately held, they have been following their own path for years: they don't exhibit at the AES or NAMM trade shows in the US, nor the Frankfurt Musikmesse in Europe, and they're not very 'visible' in the pro-audio world. Since their founding by MIT-trained physicist Dr Amar Bose, they've had most of their success in the home-stereo and 'installed-sound' markets. They're not known, though, for working and playing well with others; they're very close-mouthed about the technology in their products, and among many serious audiophiles they're not viewed particularly favourably. They even had a nasty scrap some years back with the venerable American non-profit testing organisation Consumers Union over a review in their magazine Consumer Reports which said that instruments reproduced on a pair of Bose speakers "tended to wander about the room." Bose sued, and took the case all the way to the US Supreme Court who, 14 years later, threw it out. But Bose speakers today have their adherents among home-theatre aficionados, and the company has been making serious inroads of late into the world of high-end automobile sound systems. Bose noise-cancelling headphones have become a common sight on aeroplanes, and if you glance up at the walls and ceilings of restaurants and upmarket clothing stores the world over, you'll see the company's name printed on speakers of many shapes and sizes. But you won't find many Bose speakers in recording studios, music clubs, or concert halls. What forays they have made into the live-sound world have been in the form of permanent systems in places like churches, and relatively small portable auditorium-sized systems; hardly the stuff of heavy-metal festivals. But all that could be about to change. Little Steps Or Giant Leaps? Two days after this Autumn's AES convention in New York, the company invited a group of audio journalists to their corporate headquarters four hours away, to introduce them to a new product line aimed expressly at professional musicians and the venues where they play. In a rare public appearance, Dr Bose himself spoke to the group. "Research outcomes," he said, "are usually small steps. Very seldom, you get a big step. But they do occur occasionally, and this announcement, in my opinion, is such a big step." Bose, both the man and the company, have long prided themselves on putting a premium on research. "Research lowers the balance sheet: you've got outflow without income for a long time," said Dr Bose. But since the company is not beholden to shareholders, they can pursue research paths that interest them without having to know that every path will lead to profit. "Many of the things you do in research will turn out not to be possible," he said, "but there's often fallout that's useful in other directions." So when Kenneth Jacob, the chief engineer of the company's professional systems division, told his boss that his group wanted to work on a new approach to concert sound, "I told him, 'Go ahead,' even though it meant we'd have to find budget resources outside that division." Jacob's presentation began with the Beatles' Shea Stadium debacle, which showed that radical changes had to be made if really large venues for rock & roll were ever going to be practical. By the end of the 1960s — the Woodstock festival being a prime early example — those changes had been made, and a new paradigm had taken over, which Bose engineers have dubbed the 'triple-system' approach: guitar/bass/keyboard amps on the back of the stage, monitor speakers with their own mix at the front of the stage pointed at the band, and the big cabinets pointed at the audience. 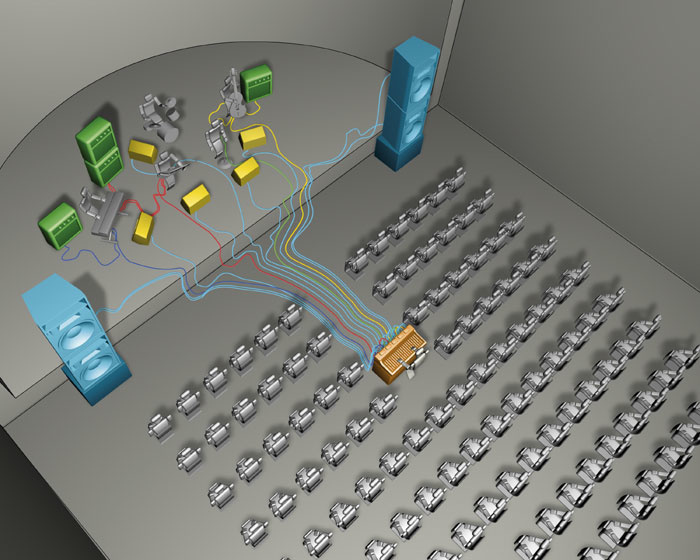 Bose's documentation makes a nice case for using their system to eliminate on-stage clutter. Here's an existing 'triple-system' PA, featuring on-stage monitoring 'wedges' for the musicians (in yellow), bass and guitar amps at the back of the stage (in green), and PA speakers projecting to the audience (in blue). Then, of course, there's the front-of-house console (in orange), and all the tie-lines connecting everything together. Here's Bose's (considerably simpler) suggested system based around the new Cylindrical Radiators.As you'll know if you've ever played live through a system like this, such an approach can create its own problems. Primary is that none of the three systems necessarily sound the same as any of the others. So while the band may think they sound OK, out in the audience, the sound might be terrible — or vice versa. And rarely is everyone in the band happy with their mix, so they turn themselves up — which results in everyone else turning themselves up, too. "It gets to the point where musicians and members of the audience are compelled to wear earplugs," said Jacob, "which means that something is terribly wrong." Artists, Jacob continued, are forced to travel with a huge amount of equipment, which must be set up, connected, and tested at each site, or else they have to rely on unfamiliar rented or house PAs. Live sound systems are so complex that small failures, like a bad cable or a shorted switch, can cause gigantic problems which take hours to track down and fix. High SPLs create lots of reverb, particularly in clubs and halls that often have poor acoustics to begin with, which overwhelm the direct sound. Loud stage monitors can make the situation much worse, since there's a constant slap delay when their sound bounces off the back wall and heads out into the house. Jacobs also pointed out issues in the psychoacoustic realm that aren't so obvious. "When we can look at what we are listening to... we gain a much deeper appreciation and understanding of what has captured our attention," he said. "You can't do that in a triple system, since sound comes from the closest speaker." And of course, that in turn may be nowhere near the instrument that's making the sound. What's more, when multiple sound sources are mixed, our ability to sort out sounds by their arrival times relative to our two ears, which is so reliable that it works even when we're blindfolded, ceases to work. The result is reduced clarity and intelligibility. The saddest part of all this is that while the use of triple systems may be unavoidable in huge arenas, it has trickled down to small clubs and halls where they may not be at all necessary. Jacob's presentation included a video with short bits of interviews with a number of working musicians, all of whom had nothing good to say about most amplified performance situations. As one artist said, "You're playing to the speaker," as opposed to the audience or the other players, "because that's all you can hear." But no-one has yet offered an alternative, especially one that can handle relatively loud music. Bose's approach to solving this is pretty radical, and at the same time surprisingly simple. Their new products are called S1 Cylindrical Radiator Loudspeakers, and are part of the new Personal Monitoring System, presumably so-called because each musician gets their own loudspeaker under the new arrangement, which plays back only the sound of their own instrument, not a mix of the whole band. Two dozen or so small drivers are arranged vertically in each S1, which is a flagpole-like structure about 3.5 inches in diameter and 86 inches high. The pole is set into a floor stand, which is 26 x 26 inches, and contains the controlling electronics (sadly, we weren't allowed to peek inside the units). The arrangement of the drivers in the pole is designed to eliminate all vertical dispersion: the sound is projected forwards, and in an arc of almost 180 degrees horizontally, but there's nothing projecting above the top of the column, and nothing bouncing off the floor. The principle behind the speaker is apparently similar to that of a diffraction-slit tweeter, something found these days in more conventional horn designs. "Any large straight source is directional," said Jacob, and the closely spaced drivers in the Cylindrical Radiator behave "to first approximation, at the wavelengths involved, as a monolithic source. This is an exceptionally large straight source in the vertical dimension, and thus is exceptionally directional in the vertical pattern." The most obvious effect of this is that, in theory at least, the sound is transferred to the room much more efficiently than with a conventional spherical-front speaker, or even a directional horn. And in fact, while a guitarist played, the journalists were invited to walk directly towards the speaker from across a large room, and observe that the difference in sound level as one approached was remarkably small, even when one put one's ears right up to the speaker. In theory, then, musicians can play at lower levels, and still fill a space. If you extrapolate this concept a bit further, you'll see it has more potential advantages. Since there's no sound projecting upwards, reverb from ceiling reflections is eliminated. 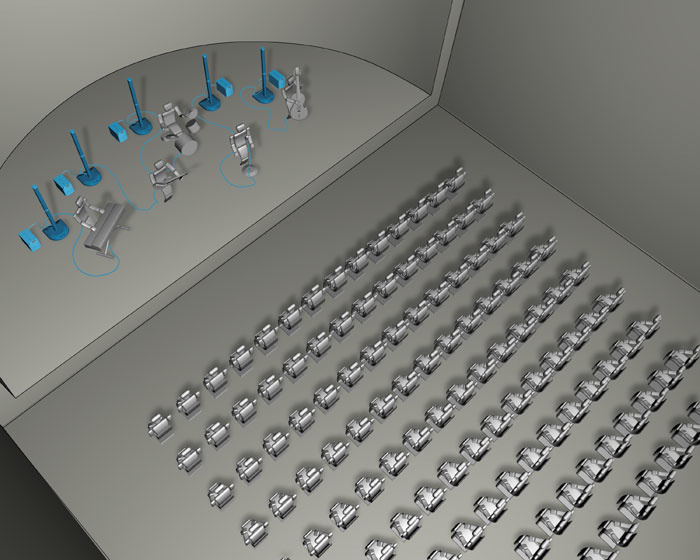 The system is compact enough that each performer (or at least each section) can have their own speaker right near them, restoring the perceptual correlation between sound and image for the audience. 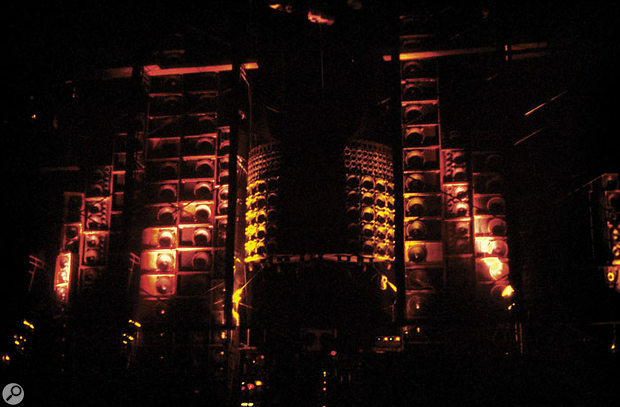 The mix is relatively uniform at any point on the stage (at least as long as no-one goes behind any of the speakers), except that each player gets to hear a little more of his or her own sound — and that means separate monitor mixes are no longer necessary. In fact, monitors themselves can be dispensed with: since the speakers are designed to go behind the perfomers, they serve as backline, monitors, and house. As in the days of acoustic performances, the musicians and the audience hear exactly the same thing, from the same speakers. You might think that putting the speakers behind the microphones would create feedback loops, but in fact, according to Jacob, the system is significantly less prone to feedback than a conventional system. "One reason is that there are far fewer signal loops that can feed back, because you have one microphone connected to one loudspeaker, instead of one microphone connected through the mixer to multiple speakers. Second, with a traditional system, to get a good level at the back of the audience means much higher levels at the stage, where the microphones are. With this approach, the stage level is almost the same as it is at the back of the room, hence lower in level, and less likely to cause feedback." 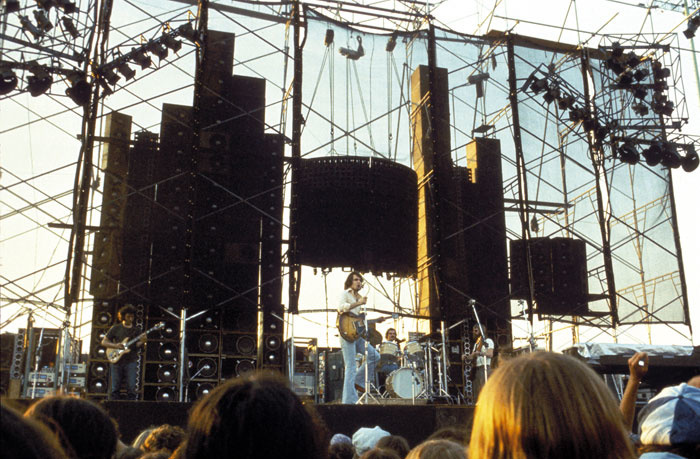 The mooted system is somewhat reminiscent of The Grateful Dead's legendary 'Wall of Sound' system of the early 1970s, which didn't use monitors, except for sidefills, and had each instrument and vocalist coming from a separate, although enormous, bank of speakers (the total was 641 drivers, driven by 26.4kW of amplifier power — for a description of this, check out www.dead.net/cavenweb/deadfile/newsletter19soundrap.html). Those who heard the system swear that they've never heard better concert sound before or since, but the idea fell victim to the oil crises of the mid-1970s, when it became too expensive to transport by road. Bose's system, fortunately, doesn't require a 40-foot trailer to haul around, nor does it require a Grateful Dead-sized budget. They are pricing the system so that working musicians can afford to own it: the starting price is US$1699 for a single S1 pole and floor stand, including a remote control with level and tone controls. (UK pricing has yet to be set, but at the time of going to press, this equates to around £1000). Built into the stand is a simple four-channel mixer, two of the channels including mic preamps and effects inserts, as well as three 275W power amps. A control panel lets you select from among 100 equalisation presets created by Bose to complement a wide range of instruments and voices. 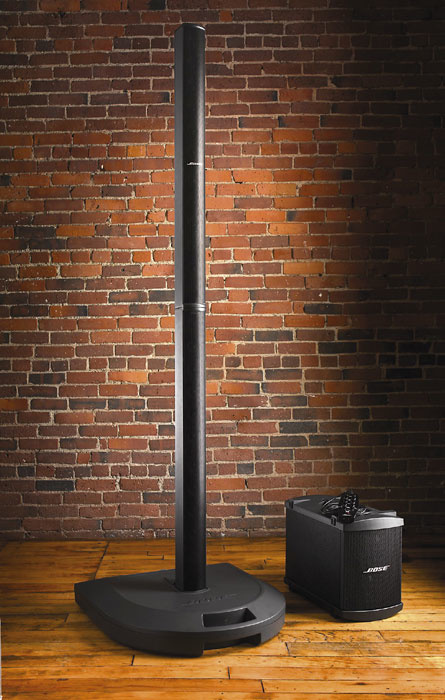 The system is designed for portability: the seven-foot pole breaks down into two sections, and the floor stand weighs in at only 35 pounds. The small drivers in the columns mean you're not going to get a lot of low end, but you can get more bottom by purchasing one or more separate B1 bass modules for $300 each (currently around £170). The system automatically re-equalises itself when you plug the 28-pound modules in, with the result that the sound remains tonally consistent, only louder. Each of the members of the seven-piece funk/blues band at Bose's demo was playing with a bass module, except for the bass player, who had six of them. There are some interesting issues raised by not having a central mixing console under the control of a dedicated engineer. Performers who are used to hearing themselves way up in their monitor mixes might have trouble getting used to dealing with a more balanced sound. If they turn themselves up too much, the audience will hear an off-balance mix, and the rest of the band might be tempted to crank their volume too. Jacob said that Bose has checked this out "thoroughly" in small- and medium-sized rooms. "Without exception, the testing showed that musicians do a fabulous job of mixing themselves. They say that when they're playing acoustically they mix themselves without difficulty, and playing using our approach is the same thing. Test groups were able to establish a mix that was superior to the vast majority of mixes created using the conventional triple-system approach... When someone solos, they naturally play louder and the other musicians modify their playing volume to make the solo more pronounced, something that acoustic instrument players have always done live naturally." A crucial question, of course, is whether a system like this can be loud enough to be practical in the real world. In the nightclub-sized room where the demo took place, Bose's band was able to get some very respectable levels going. Jacob said the systems were operating nowhere near capacity, and that the company has tested them with rock bands in 400-seat theatres with 100-foot throws. Bose anticipates these systems will be used primarily in smaller venues — "There are a lot more of those than there are bigger ones" Jacob said — although he also noted that they would be appropriate for a larger hall as part of a hybrid setup: the band and the audience close to the stage could benefit from the Bose system, while a second, conventional system, pointing away from the stage, would project the sound to the rest of the audience. "In this configuration," said Jacob, "the musicians will enjoy all of the benefits of the new approach — namely playing better, because they can hear themselves and each other." It would be very instructive to see such a system in action. I asked about whether there could eventually be a smaller version, suitable perhaps for busking. Although one engineer laughed at my subsequent suggestion of a battery-powered model — the units apparently consume a lot of power — Jacob says he's interested in "extending the technology in both directions" — that is to say, larger and smaller. So will Bose's Cylindrical Radiators do what the company claims they will to clean up live music? It's going to take a lot more than a nicely controlled demo in front of a bunch of audio scribes to convince the musical world that these things can put up with the vagaries of travel — the dank, smoke-filled rooms they'll be asked to perform in, and the unpredictable musical and social behavior of musicians and fans alike. But from the point of view of this middle-aged rock & roller, the concept makes a lot of sense... it's something of a get-back to the days when amps and drums didn't have to be miked, when a Fender Twin Reverb with an extra cabinet was the best vocal PA you could want, and when I was the only one responsible for how the music I was playing sounded. Certainly, schlepping a seven-foot column collapsed into something the size of a trombone case, a couple of bass modules, and a good effects/amp-simulator pedalboard seems a small price to pay for regaining complete control over one's own sound. Especially when you compare it to the traditional alternative: hauling around a Marshall stack whose output will get squeezed through a single SM57, then mangled by a Guinness-soaked mixer and shoved through suspicious-smelling power amps into a pair of grungy cabinets whose best days were before they left the factory, all of which are under the control of an engineer who would much rather be at home watching television. Bose +44 (0)870 741 4500.